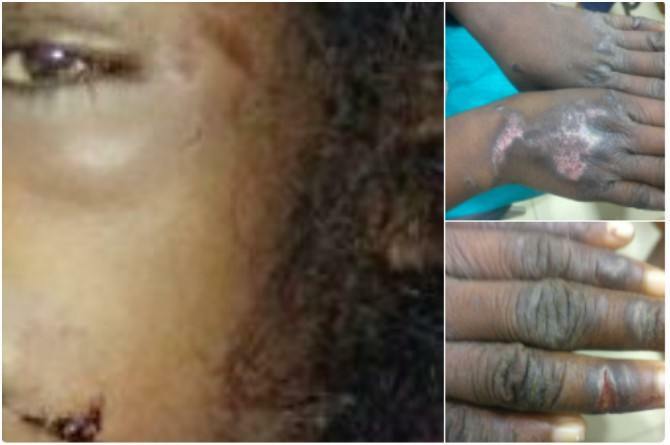 Shocker From Delhi: 14-Year-Old Maid Bitten, Beaten And Burnt By Dentist Employer! The dentist, Nidhi Chaudhary, lives in North-west Delhi's Kalyan Vihar. The 14-year-old maid was employed at her house for the last four months. The Delhi Commission for Women said that the minor maid is a tribal from Jharkhand. We might make tall claims on how we care about the underprivileged. But, when it comes to reality, it is the rich who are often caught exploiting the poor. Case in point is a news that would send chills down your spine. A Delhi dentist was arrested as for burning, biting and beating her 14-year-old maid. The dentist, Nidhi Chaudhary, lives in North-west Delhi's Kalyan Vihar. The 14-year-old maid was employed at her house for the last four months. The Delhi Commission for Women (DCW) says that the minor maid is a tribal from Jharkhand. She was hired through an agency. The incident came to light when a concerned neighbour alerted the DCW by calling them on their number 181. "We rescued the 14-year-old Jharkhandi domestic maid from Model Town. Can't describe her condition! She was burnt, beaten, attacked with a scissor, spat at and bitten by lady employer who is a doctor! Most evil!" tweeted Swati Jai Hind, the Chairperson of DCW. Swati says that what's shocking is that the employer was a popular dentist. Despite that, the maid did not even have a sweater in this cold weather. She would be given only two slices of bread every two days and was severely malnourished. "Little girl was so brave. Her lady employer so vicious. A doctor herself, how could she torture a 14-year-old in such a brutal manner. The little girl was confined to house, not given sweater, blankets, food and has been reduced to bones. Police arrested lady employer! Should be given maximum punishment!" she wrote in another Tweet. The DCW also issued a press release which said that the girl had "deep marks, cuts and bruises all over her body". She was "burnt with an iron and hot water was thrown at her quite often". An FIR has been registered under the Bonded Labour Act, says the Deputy Commissioner of Police, North-west Delhi, Aslam Khan. The dentist employer has been arrested and the police also raided the employment agency. The child is under the protection of the child welfare committee and DCW counsellors currently, add reports. The police are now investigating the matter. The health issue behind this Mumbai teen's sore eyes will SHOCK you!